Toting your favorite casserole to the family picnic will be a snap with this pretty and practical carrier. 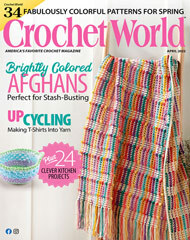 This e-pattern was originally published in Crochet World June 2009. Size: Fits one 2 1/2-quart glass casserole dish with lid. Made with bulky (chunky) weight yarn and sizes H (5mm) and L (8mm) hooks.